At 4:30 am, San Pablo Avenue is dark and deserted. But inside the new German bakery-restaurant Gaumenkitzel, the quiet is broken by a pleasant, but insistent thrum as Anja Voth grinds wheat berries into flour. 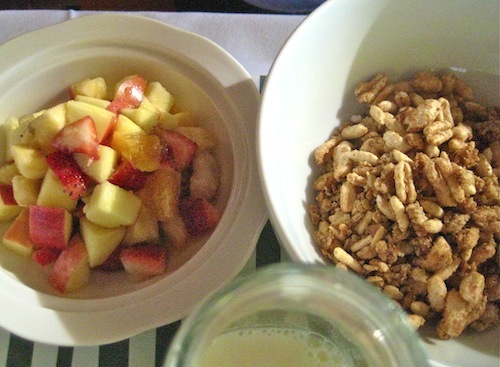 The chef channels her grandmother’s spirit, getting an early start each morning to flake the oats and barley she will include in her hot porridge, granola and muesli and mill the whole wheat flour she will bake into rolls and bread. The light-filled, cheery space, designed by husband Kai Flache, welcomes with paint-box colored wooden chairs in red, yellow, blue and green. 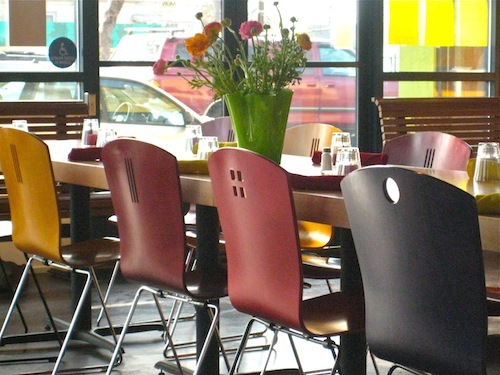 What is not visible, however, is chef Voth’s time–consuming commitment to make all her ingredients from scratch. A modest note on the menu mentions her dedication to organic, sustainable, local ingredients, inspired by the slow food movement. As Voth rolls and kneads her bread by hand, she describes her inspiring grandmother, “She was a smart shopper with that traditional pre-WWII mentality: frugal, practical, seasonal: grow it or make it yourself and don’t waste. For centuries, this is the healthy way people cooked.” Voth, who lives in the neighborhood and walks to work, definitely outdoes grandma, however, by also producing her own yogurt, jam, mayonnaise, pickles, tomato sauce, fruit juices, as well as the marzipan (from ground almonds, sugar and rose-water) that goes in her Nusskuchen cake. “I like to make things from scratch,” says Voth, “because I can determine their quality and taste”. Her low-sugar jellies come in flavors like ruby grapefruit and thyme or blood orange and rosemary. Growing up, Voth was the family’s designated jam-maker from the bounty of their fruit trees. While she was studying linguistics at the University of Hamburg, she polished her culinary skills working as bartender, breakfast cook and pastry maker. Voth and her husband are gratified that in the 7 weeks Gaumenkitzel (meaning palate–pleaser or delicacy) has been open, it has already attracted a group of regulars, especially on the weekends when Germans drive in for a classic Frühstück (breakfast)*. The Gourmet Plate provides a taste of everything: 3 slices of cold meats, a tiny mound of lox, a boiled egg, 3 kinds of cheese, morsels of fruit, a spoonful of homemade marmalade and a basket of house-milled wheat breads. Satisfying without over-stuffing. For something lighter, try Knuspermüsli, a tasty, light, crispy granola made from oats, barley, puffed rice, almond and coconut. Traditional, healthy Bircher Müsli combines grated apple, oats, caramel-cream and toasted almonds. 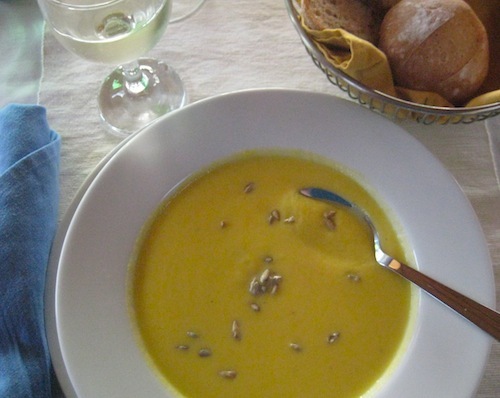 The lunch menu may offer a bowl of fish soup or orange cauliflower soup sprinkled with sunflower seeds, spinach or endive salad or cod cake and kohlrabi. Teatime features several house made cakes and cookies. 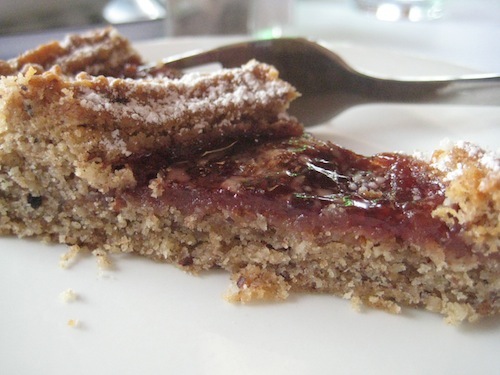 The linzer torte — raspberry jam on a crumbly hazelnut cake, comes in a thin slice, which forces you to slowly savor every scrumptious bite. A surprise for American appetites may be the menu for Abendbrot, the traditional light evening meal that follows the wise German saying, “Eat breakfast like a king, lunch like a prince, and dinner like a pauper.” Supper, served from 4:30-6:30, may include a salad of smoked trout, a cold-cut plate, or beef roulade with braised red cabbage and mashed potato and a fruit dessert like apple compote with whipped cream. Voth recently introduced German beer and organic wine and plans to expand her menu even further. If your image of “German food” is a stocky stereotype of sausage and schnitzel, you are probably thinking of Southern German cooking. Voth, who grew up in Hamburg, describes Northern German cooking as lighter, with less meat and more fish and bacon. Another staple of Northern cuisine is mixing fruit with meats. For example, Voth cites a sweet and sour soup with prunes and bacon or a dish combining pears, French beans and bacon. Sounds intriguing, but it’s not available yet, as Voth won’t be making it until green beans are in season. And just wait till you see what she’s planning to do when fresh local berries start arriving…. * (If you are breakfast-obsessed, like I am, check out Mr. Breakfast , a website that describes breakfasts around the world with recipes). 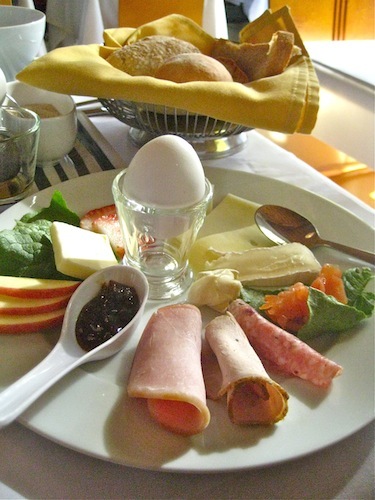 This entry was posted in German Food and tagged gaumenkitzel, German breakfast. Bookmark the permalink. I, too, like the continental breakfasts offered in European hotels; most recently, breakfast at a small hotel in Munich. Cheeses, breads, jams, yogurt, cereals, teas, pastries, and on.